What do you need to get started coloring? You don’t need much. Coloring for adults can be very inexpensive, but it’s easy to get caught up in thinking you must have all the premium supplies or tons of coloring books. In fact, you probably have what you need at home already. Believe me, I get tempted by all the supplies too, but the extras certainly aren’t necessary to get started, and more importantly, to feel the many benefits of coloring. Borrowing your kid’s or grand kid’s supplies, such as crayons, markers, or colored pencils. (Even if you only have one red or green Sharpie in the house, you can get creative and make something artsy!) Try blending or creating texture with one Sharpie marker. If you happen to have a few bucks, you can go to any dollar-type store and pick up some gel pens or other coloring tool and a coloring book, and be back home coloring in no time! There are also tons of creative coloring related websites that give away free samples of their coloring pages, if you sign up to their email list. I have two freebie samples available here, if you’d like to look. Doodling or drawing something on a blank piece of paper and coloring it in. Using an envelope. It may sound silly, but occasionally you can find a cool design to color on the inside of a business envelope like the one shown on the right. Sketching your name in block or bubble letters and filling it with a design to color. Coloring without lines. Just lay some color on a page in a free-style manner like the page you see on the bottom left. The point is to get started! Enjoy the fact that coloring’s here to stay and it doesn’t have to be expensive! Just think of the KISS principle (Keep it simple, silly! ), and begin feeling the value and benefits of coloring. Here’s to getting started coloring! P.S. Would you like a free sample coloring page? 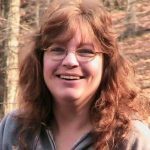 She's authored several books including coloring journals and unique grayscale coloring books. Her plans are to keep creating, but when she's not working on book projects, you might find her taking close up pictures of flowers or going on back road rides to falls or fire towers with her husband of 20+ years.